Win*Star Express V6Click thumbnail for screen-shot. Win*Star Express is part of the newest generation of innovative Matrix programs combining professional-level tools with true one-click ease of use. 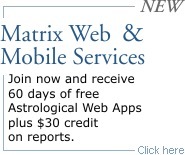 You do not have to be a trained astrologer, nor a computer whiz, in order to use this software. Novices and beginners – Win*Star Express is the star of our Express Personal software group. Although professionals throughout the world swear by this program, it was actually designed with amateur astrologers, students and novices in mind. Win*Star Express v6 goes even farther than its very successful predecessor, offering you a wide range of supportive learning tools; these allow you, from the moment you open the program, to easily produce professional-level results. Put those results to immediate use!! In our over-30-years of experience, we have found that the best way to improve knowledge and skill in astrology is to see it working for you personally, and then, benefiting those around you. This way it becomes the kind of knowledge that sticks! Fast! Create a natal chart, and instantly reveal characteristics about yourself, your family members, your friends or lovers, your co-workers, that may surprise you. Click a button, and you will have an instant transit or progressed chart, giving you an advanced look at upcoming events. Pop into Day Scan and there you will find a detailed list (with interpretations) of the planetary events influential in your life–look at an hour-by-hour report of these events, or look ahead weeks, months, or even for years at a time, to get a glimpse of what is coming. 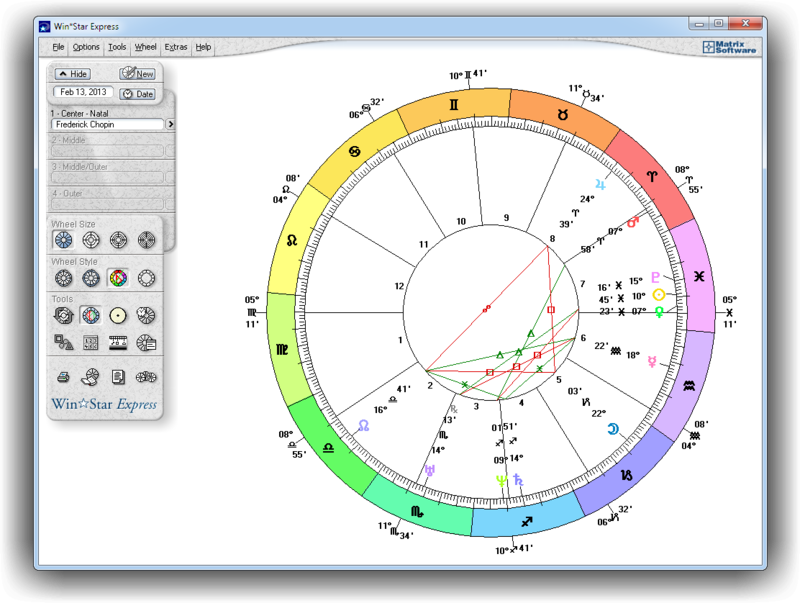 Win*Star Express v6 also lets you do instant Solar and Lunar Return charts. It is simply amazing!! 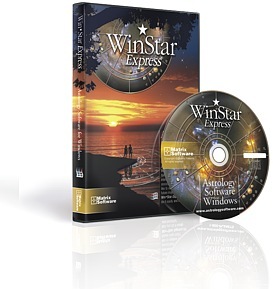 Take a look at Win*Star Express, the results are the most accurate and highest quality available today (the same engine that drives our highly respected professional-level programs powers Win*Star Express v6), and the interface is the most user-friendly you will find in any astrology program. This newest edition of Win*Star Express also includes printable Natal, Synastry, Transit, Progressed, and Solar Arc interpretations. You can give your program even more interpreting power by adding one or more Win*Writer Express report programs. Win*Writer Express report software is created in collaboration with the world's leading professional astrologers to give you comprehensive, in-depth interpretations instantly. New: Natal, Synastry, Transit, Progressed and Solar Arc interpretations. Instant natal, transits, progressions, directions, solar and lunar return charts. A complete Astro*Tutor with DeVore's Encyclopedia of Astrology. 4 chart styles: Standard, Unequal, European or Aries. An innovative graphic aspect finder and display. Pop-up onscreen interpretations. Time Scans for up to 21 years. Choice of all major house systems. Geocentric or Heliocentric charts. Instant chart and aspect data viewers. Instant onscreen help. Free technical assistance. Win*Star Express also includes: helpful onscreen "how-do-I's" that give you fast answers to your questions and an interactive Astro*Tutor with complete explanations of astrological terms and techniques. A couple of things to remember about all Matrix Software programs – you have free Technical Support for as long as you own your software, and if you decide to move to the next level of software, we will give you credit for your previous purchase when we transfer your software license to the new program. No matter what you are told, one program cannot meet the needs of everyone. For that reason Matrix Software offers our customers three different levels of programs, and a path to move from one to the next (if you choose to) and carry your investment to the next level when you are ready. 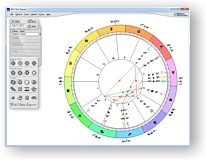 Satisfaction with every level of Matrix Software is what has helped us serve astrologers of every level, and non-astrologers who recognize the many benefits of astrology, for 37 years.